Try It: If you're not wonderful at mad updos but want something a bit special, this will keep your hair out of your face, but doesn't require loads of time and effort. Set the ends of you hair only on large heated rollers, rolling out, not under. If your hair is wavy, straighten the shorter layers to keep it sleek. Comb the front section of the hair back, securing with a sparkly slide. Remove the rollers from the bottom layers for flicky, waved ends. Set with some strong-hold spray. Suits: Thick, long, straight or slightly wavy hair, or relaxed afro hair. Try It: This look requires a lot of time and you'll probably need a friends help. Pull your hair into a tight, sleek ponytail on the crown of your head. Separate hair into around 20 sections and use wide barelled tongs to make rolls of hair. Pin each to the head, working around the head first, then pinning the central coils to the OTHER coils, rather than the head to build up the shape. 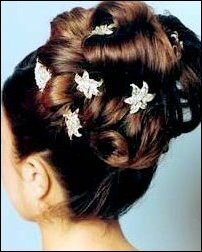 Spray with loads of strong-hold product, and decorate with diamante hair accessories. 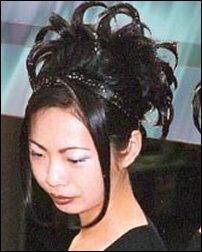 Suits: Fine to medium layered hair. Try It: This look is best acheived with a pair of ceramic straighteners, as the flicks will hold better than if you tong the hair. Separate bone dry hair into section about 2 inches wide, and run the straighteners down the length, twisting your wrist to flick the hair up on itself as you go. Around the front, use the straighteners to flick the hair back away from the face, playing close attention to the fringe (bangs) area. Finish with a little wax or texturising cream on the very ends to define the layers. Suits: Fine to Medium bobbed hair. Try It: Who said you can't curl shorter hair? The trick is not to make the curls too tight. 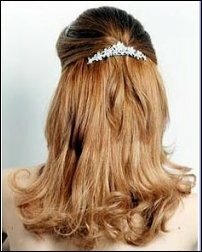 If you usually wear your hair straight, this would make a great change for a formal occasion. Put small sections of hair onto medium sized rollers (either heated, or put damp hair on velcro ones and allow it to dry). As you remove the rollers once they've cooled, tease the curls into waves, and backcomb the front of your hair to add a little volume at the crown. Try It: Don't wash your hair before trying this - a little oil will help it stay up. Leaving the fringe area loose, pull the bulk of your hair back into a tight twist on your head, positioning high enough up that around 2 inches fans out at the top. Pin tightly into place. Using tongs, curl the loose ends round and spritz with spray gel so they create a 'crown'. Part the fringe area on the side and use straighteners to create two smooth sections that frame the face. Add an alice band if you wish. Suits: Mid to Long hair. Any thickness. Try It: Curls are a classic, timeless formal look and great if you want to wear your hair down but want a change from your usual look. These loose, romantic curls can be created with small sized rollers left in for a long time, or with a wide barrel tong. You could also try twisting the hair until it rolls back on itself, pinning it to your head and setting it with the heat from hair straighteners for a looser wave. Remember to use a good curl hold product before and a strong hold spray afterwards.